Listen to the podcast. Find it on iTunes. Read a full transcript or download a copy. Sponsor: The Open Group. Later this month, The Open Group’s first conference in Australia will focus on "How Does Enterprise Architecture Transform an Enterprise?" With special attention devoted to enterprise transformation, speakers and a variety of sessions will place the transformation in the context of such vertical industries as finance, defense, exploration, mining, and minerals. As a prelude to the event, BriefingsDirect recently interviewed two of the main speakers at the conference -- Hugh Evans, the Chief Executive Officer of Enterprise Architects, a specialist enterprise architecture (EA) firm based in Melbourne, Australia, and Craig Martin, Chief Operations Officer and Chief Architect at Enterprise Architects. Gardner: What are some of the big problems that businesses are facing that architecture-level solutions can benefit? Evans: I'll start with the trend in the industry around fast-paced change and disruptive innovation. You'll find that many organizations, many industries, at the moment in the U.S., Australia, and around the world are struggling with the challenges of how to reinvent themselves with an increasing number of interesting and innovative business models coming through. Gardner: Is there anything about the past 10 or 15 years in business practices that have led now to this need for a greater emphasis on that strategic architectural level of thinking? 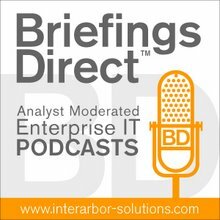 Evans: EA is now around 30 years old, but the rise in EA has really come from the need for IT systems to interoperate and to create common standards and common understanding within an organization for how an IT estate is going to come together and deliver the right type of business value. Business architecture, as well as strategic architecture, is still quite a nascent capability for organizations, and many organizations are really still trying to get a grip on this. The general rule is that organizations don’t manage this so well at the moment, but organizations are looking to improving in this area, because of the obvious, even heuristic, payoffs that you get from being better organized. Gardner: Craig, in your presentation at The Open Group Conference in Sydney, what do you hope to accomplish? Martin: How do I build cohesion in an organization? How do I look at different types of scenarios that I can execute against? What are the better ways to assemble all the efforts in my organization to achieve those outcomes? That’s taking us through a variety of examples that will be quite visual. Gardner: How do you often find that enterprises get beyond the inertia and into this discussion about architecture and about the strategic benefits of it? Martin: We often have two market segments, where a Tier 1 type company would want to build the capability themselves. So there's a journey that we need to take them on around how to have a business-architecture capability while delivering the actual outcomes? Evans: I agree with Craig on the point that, if you show the business what can actually be delivered such as views on a page that elicit the right types of discussions and that demonstrate the issues, when they see what they're going to get delivered, typically the eyes light up and they say, "I want one of those things."